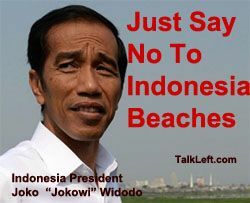 It's also clear that President Joko has no clue about the facts of the Bali 9 case. It seems to be a rubber-stamped decision. Mr Joko seemed ignorant of the young man's specific circumstances. When asked why he had been so hardline when the Bali Nine were taking drugs out of the country, not bringing them in, Mr Joko replied: "Says who that he was taking them out?" Mr Joko said: "I did not hand down the death sentence. My obligation is to decide on clemency, and I won't grand clemency to drugs convicts"
Why do Myuran (and Andrew)deserve clemency, even under Indonesia's corrupt and unjust system? (It is beyond absurd that Indonesia sentences drug dealers to death and houses them at Kerobokan where the guards who run the prison sell drugs to the inmates.) I explain why here . Read through his accomplishments while in prison. 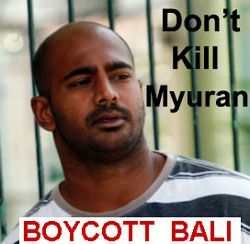 Also please check out the Mercy Campaign and sign the petition to save Myuran. I've been on a campaign to boycott Bali since 2005. I'm not giving up. There are beautiful beaches all over the world. A country that sentences teens with no prior record to life in prison and young adults to death is a country with an inhumane system of justice that does not deserve to have tourists -- or their dollars. Kerobokan Prison is an over-crowded prison with inhumane conditions and corrupt guards. No wonder it's called "Hell on Earth." While all executions are barbaric, Indonesia's are even more so than most. THE shots usually ring out at dawn's first light, from an isolated clearing or deserted beach. Indonesia's condemned may suffer an agonising death. Hooded and handcuffed to a chair or post, they wear a white apron with a red cross marking their heart. The condemned does not always die instantly, requiring a final shot to the heart or temple minutes later. ...The executions occur unannounced, with police often dispatching decoy convoys to distract relatives or the media. The condemned receive about three days' warning. They were willing to peddle a drug that causes untold misery and death. They deserve to pay a heavy price for their deeds, but not even this reprehensible crime justifies a punishment that denies all hope of redemption or rehabilitation. Australia hasn't done enough to help its citizens. With two young men facing a firing squad because they were arrested in Indonesia rather than in Australia (as they might well have been had the police acted differently), the Government has reason to question whether our respect for our neighbours' sovereignty must always come at the expense of our nation's expressed support for human rights. There are 64 inmates currently awaiting death in Indonesia for drug offenses. (There are 2 waiting death for terrorism crimes.) Human rights groups say the executions violate the International Covenant on Civil and Political Rights, ratified by Indonesia in 2005. You don't suggest what you think a reasonable deterrent jail term would be for someone who is smuggling nearly twenty pounds of heroin (i.e. not for personal use or small amounts for resale to support his own habit). Or should heroin simply be legalized so that we don't put fine businessmen like this one in prisons? In the U.S., 8.3 kilos would be 10 years, less if he cooperated after his arrest. I think his conditions of confinement warrant a further reduction of half to 5 years. He is only asking he not be put to death. The solutions that the United States have adapted over the last 30+ years are ineffective and costly to the public in many ways. While rehabilitation may be able to help some, the relapse rate is above 90%. That being an optimistic number. I also do not believe that the Indonesian people are willing to accept the revolving door system of rehab that the United States has adapted. Financially law enforcement make billions and a whole economy ( counselors, psychiatrists,etc...) has been created to battle these social ills, while the neighborhoods , schools and households continue to pay the price for the failures of these " humanitarian solutions". President Jokowi is sending a clear signal to the people of Indonesia and abroad. He will protect his nation from this scourge that has destroyed countless lives worldwide and left the United States in social ruin.